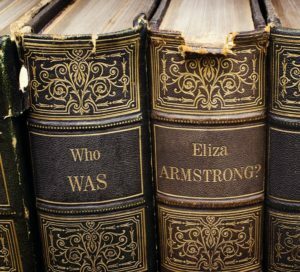 Who Was … Eliza Armstrong? In history there are many souls assigned to oblivion, due mainly to circumstances at their death, and a lack of connecting information with their living past. One such person is Eliza Armstrong. Eliza was a partner to George Clark (1818-1854) who was a brother of my great great great grandfather William Henry Clark. 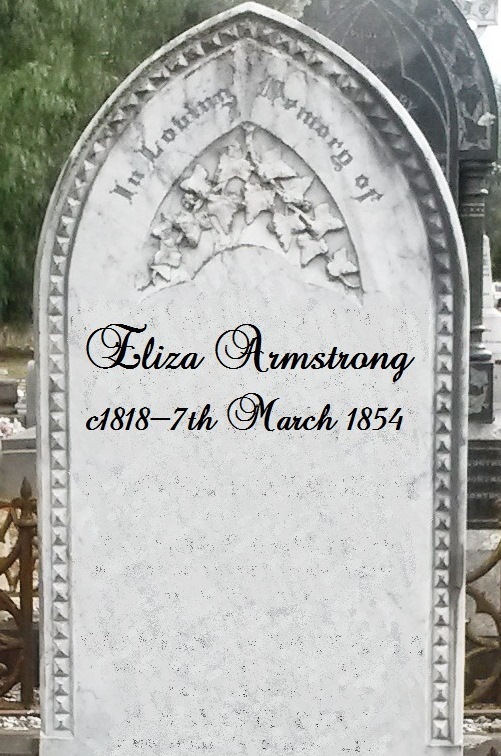 The only documents relating to Eliza Armstrong in Wangaratta record her death, and they were frugal with information. The acting Assistant Deputy Registrar for Wangaratta in April 1854 was Edward Lucas. He recorded on Eliza’s death certificate only her name, the date that she died (which was actually wrong) and that an inquest determined that her death was caused by excessive drinking. Eliza was given no age, no birthplace and no parents. The section of the certificate for information on any marriage or children was left blank so we can’t tell if Armstrong was her maiden or married name, and there is no evidence if she had any children with George Clark. Even her age was omitted until letters between Lucas and Thomas Sunderland, a senior clerk in the Registrar General’s Office, established “supposed age about 35 years”. Much of this lack of information is probably due to the way that she died and the disrespect given to both inebriates and women who cohabited with men. But some of it was also due to Eliza’s partner George Clark’s own failings. He survived Eliza by only three months, dying from delirium tremons, a consequence of excessive alcohol intake. By the time Thomas Sunderland was attempting to fill in some of the blanks on Eliza’s death certificate George Clark was dead and the only information available was from the inquest into Eliza’s death, at which the likely inebriated George was the prime witness. Held at the Royal Hotel (now the Pinsent) in Reid Street on the 8th March 1854 (the day after Eliza’s death), the inquest heard from George Philips, a sailor then living in Wangaratta, that Eliza had been drinking for the fortnight he had known her. He also deposed that George Clark seemed kind to Eliza and that he had never seen Clark “ill use”, that is, be violent towards her. This was particularly important testimony as the circumstances of Eliza’s death were unusual with George Clark waking up next to her dead body. Clark deposed that Eliza had been complaining of illness for the seven months before her death, and despite drinking heavily for some time, had not taken drink on the day of her death. Clark, who was a sailor like Philips, had been living with Eliza for 18 months. The inquest, conducted by coroner Dr William Augustus Dobbyn was short and incomplete. Dobbyn was new to Wangaratta and went on to have a long history as the local coroner and medical practitioner. He was, however, not always attentive to his duty and at times himself presented drunk to emergencies and births, and was involved in some less than savoury incidents involving preventable deaths. How much Dobbyn influenced this inquest is unknown. Certainly no other witnesses were called and the questioning of the two witnesses seems unusually sparse. Dobbyn did not carry out a post-mortem, or that part of the inquest has not survived, so it is impossible to say if Eliza had a disease caused by alcoholism or something else. Either way, the jurors were quick to determine, probably with Dobbyn’s recommendation, that “the deceased Eliza Armstrong died from the effects of liquor”. The jurors were: Dominick Farrell, James Britcheson, Henry Augustus Clarke, Benjamin Slater, James Fahey, George Gordon MacPherson, John Maloney, George Minson, Eben Ellingwood and William Byrne. Eliza’s death certificate was completed more than four weeks after the event – on 11th April 1854. Her death date was incorrectly recorded as the 22nd February and no date of burial is mentioned. Records from Wangaratta cemetery for the 1850s have not survived, and Eliza’s death certificate only notes that she was buried at Wangaratta cemetery with George Clark as a witness. No local newspaper existed in 1854 with the Beechworth-based Ovens & Murray Advertiser commencing in 1855. Although Wangaratta was proclaimed a place where a Court of Petty Sessions could be held in March 1851, extant records begin only in 1858. If anyone can shed any light on who Eliza Armstrong was please contact me.